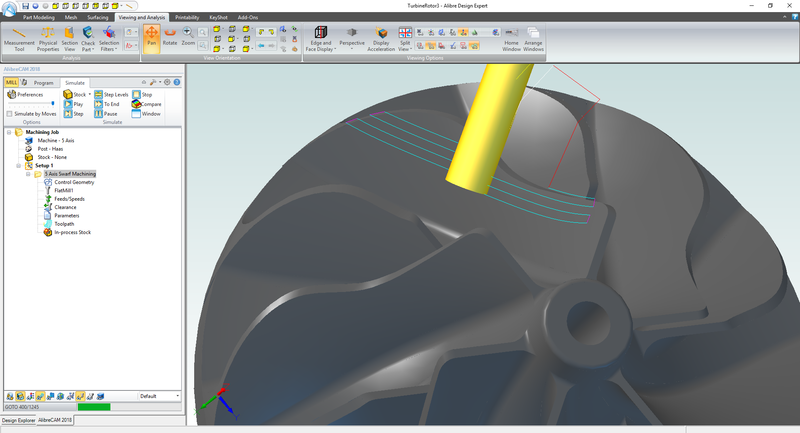 Marrying the power and functionality of Alibre’s 3D CAD software Alibre Design with the robust and powerful milling capabilities of MecSoft’s standalone CAM software, AlibreCAM 2019 delivers outstanding ease of use, associativity to design, power, speed and affordability. There isn’t a better CAD/CAM software package on the market for the price than the combination of Alibre Design and VisualCAM. The MILL module of this product has an extremely powerful feature set that allows the user to generate 2 1/2, 3, 4 and 5 axis continuous tool paths for CNC machining your Alibre Design 3D models. It comes with hundreds of free posts as well as the ability to generate your own if needed. AlibreCAM 2019 CAM software comes in 5 different configurations to suit the varied machining needs of our customers. This is a general purpose program tailored for hobbyists, makers and students. Ideal for getting started with CAM programming. Includes 2 & 3 axis machining methods. Packed with sufficiently powerful manufacturing methods this easy to use package is not only effective but also attractively priced for the budget conscious or entry level buyer. This configuration allows 4th Axis Indexed and continuous roughing and finishing operations. Curve based continuous machining such as 4 Axis Facing, Pocketing, Profiling & Engraving as well as Surface/solids/meshes based machining such as Roughing, Finishing and Curve Projection machining are available. This configuration includes all of the functionality included in the STD configuration.